Compile and study these coordinating reports (see Mythopoeia), analyzing them for details which possibly weakened or strengthened the tested alignment. 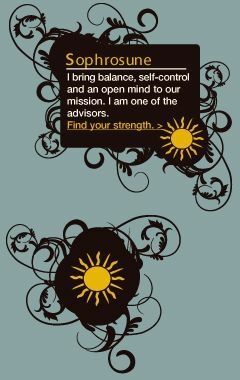 I bring balance, self-control and an open mind to our mission. I am one of the advisors. Okay, it's a dangerous and complicated mission. You KNOW I can't describe it in detail in public. But... let's just say that something exciting is going down in Buenos Aires within the next week. And we need the help of thumos and sophrosune to make sure it goes off without a hitch. If you want to help Diego and his allies in Argentina plan, send Diego an email NOW: malabar_diego@gmail.com. Tell him you know about the special errand he has to run and you want to help with the plan. He'll fill you in on the details, and you can help him make a really fail-proof plan. There will be no Epic Fail on this mission. So write Diego and help him out! If we want to win the gold on August 24th in the Multiverse Olympiad, we need to know what our teams are up against. How fast are the fastest labyrinth teams in the other worlds? Sophrosune and Sofia, if Ariadne's dance ever really existed in this world, then surely you two can work together to find the evidence. Chapter 24 of The Lost Ring Codex tells us that the best way to coordinate multiverse navigation is during the first two weeks of August, when the other worlds practice a nightly ritual. They call it "Ariadne's dance". The Codex authors say that the tradition was somewhat known in this world. Can you find out if Ariadne's dance really exists? If so, are there any instructions in this world that teach us how to do it? Sophrusune, you can help the agonothetai combine strengths! Suddenly, all of the "six allies" seems to be on a different mission. That's good, of course -- because we all have different strengths. But I want to make sure we all have a chance to help each other and join forces! I'm dikaiosune -- so I'm spending most of my time organizing lost sport training events. Diego is Mythopoeia, and he has finally started telling us a pretty big story: the story of his geographic investigations! What did he learn, and what can we do with it? Lucie is Chariton, and it sounds like she's on a mission to make our "ring" of agonothetai even bigger. Her latest blog post seems to say she's off to the middle east to find new allies? Can we help her? Meihui is sofia, and she's... well, what IS Meihui doing?? Her latest blog post is "The whole new me?" and I'm not sure what that means. I see she's still collecting the Lost Ring Codex chapters, but what's her current mission? Can you talk to her and figure out how, exactly, she's putting her sofia skills to use? Help us track everyone's missions so we can be sure to help each other, and combine our strengths! Sophrosune, your strength can help us share our most important clues with as many people as possible. We have English language translations of The Lost Ring Codex. But the codex was hidden all over the world for a reason. It's meant for more eyes than our own. Can you help us prepare versions of the codex for as many people as possible? If you can't translate the text, can you find others? Our 8 languages would be a start. But of course there are many more... Kai built our forums so we can create new ones whenever we need them. Let me know -- do we need a Dutch forum? A Hindi forum? We can make one! What is "The Lost Ring"
Sophrosune, your strength can help us figure out exactly what our mission is. It's pretty hard to "find" something when you have no idea what it is. We know we have to "trovu la ringon perditan" -- find the lost ring. But seriously, what IS the lost ring? We've been working together for three weeks now, and we still haven't figured out exactly what we're supposed to be finding. I say we make a list of all of the possible theories, and then we can discuss and take a vote. What is "the lost ring"? And how will we know if we've "found" it? This page was last modified 22:07, 21 July 2008. This page has been accessed 16,480 times.